May I start by thanking all of you for joining us today. Just an hour ago, I had the honour to present my credentials to Her Majesty the Queen at Buckingham Palace. 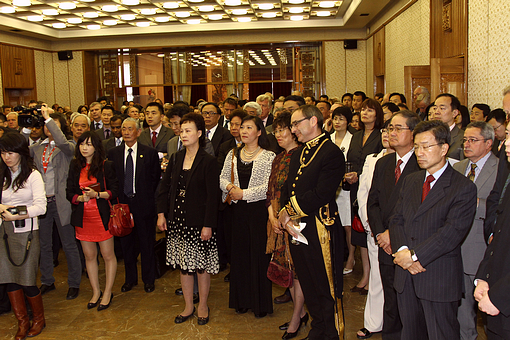 I conveyed to Her Majesty the cordial greetings of President Hu Jintao. Her Majesty asked me to send her regards to President Hu and recalled with pleasure her visit to China in 1986 and President Jiang Zemin's visit to the UK in 1999 and President Hu’s visit in 2005. Her Majesty showed a keen interest in the relationship between the UK and China and wished me well in the UK. I am the 11th Ambassador of the People’s Republic of China to the United Kingdom since the two countries established diplomatic ties at ambassadorial level in 1972. People here have kept telling me that I came “at an interesting and important time”. I certainly do agree. The relationship between our two countries has come a long way in the past 38 years. Today we have a vibrant comprehensive strategic partnership and regular high-level exchanges, not least through the annual Prime Ministers’ visit, the Economic and Financial Dialogue, and the Strategic Dialogue. We developed close cooperation in a wide range of areas and coordination in major international and regional issues. Take a few concrete examples. 38 years ago, bilateral trade was merely 300 million US dollars, last year it was 39.1 billion US dollars, an increase of more than 130 times. 38 years ago, only a few dozen Chinese students came to study in the UK, today that number soared to almost 100 thousand, making China the largest source of overseas students for the UK. 38 years ago, 1 thousand people traveled between the two countries annually, today thousands of visits are made every day. The China-UK relationship has gone a long way beyond the bilateral scope and is taking on strategic and global significance. As the world around us undergoes profound changes, China and the UK, as two major players in the world, share greater common interests and are expected to fulfill more responsibilities in tackling international challenges. A growing China-UK relationship, therefore, is not only in the interest of the two countries and peoples, but also serves the interest of maintaining world peace, stability and prosperity. We now stand at a fresh start in our relations. There has been a general election in this country and a new government is in place. The impression I have got through talking to people from different parties and sectors in my first three months here is that they all recognize the importance of China and supports the stronger growth of our relations. I am very happy that Prime Minister Cameron talked with Premier Wen Jiabao on the phone on his second day in office. 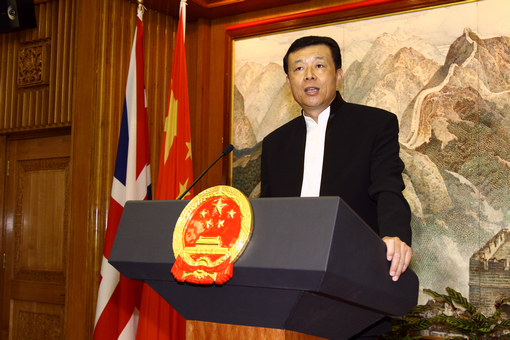 A few days ago, Foreign Minister Yang Jiechi also had a telephone conversation with Foreign Secretary Hague. Both the two leaders and Foreign Ministers agreed to further expand and advance China-UK strategic partnership and step up dialogue and cooperation in various areas. The ongoing Shanghai World Expo offers a new opportunity for enhancing friendship and understanding as well as cooperation between our peoples. The Chinese and English languages share a proverb: Time and tide wait for no man. As the new Chinese Ambassador to the UK, I am keenly aware of my responsibilities. I will do my utmost to fulfill my duties by strengthening China-UK strategic consensus and mutual trust, facilitating all-round cooperation between the two countries, and increasing understanding and friendship between the two peoples. I also wish to take this opportunity to thank all of you present today for your commitment and effort for promoting China-UK cooperation and for your support to the Chinese Embassy and my predecessors. I sincerely hope that I can continue to count on your generous support in the months and years ahead. I look forward to working with you to take the China-UK relationship to a new high.